My friend Jessica launched her e-book, Organizing Life as Mom, this week…and I had to share it with you! This 125-page ebook provides a game plan for your life as wife, mother, and home manager. How do you know what to spend your time on? How do you keep track of a budget, housekeeping chores, and the kids? Moms, family managers, and individuals looking to be more organized can all benefit from this 125-page book. 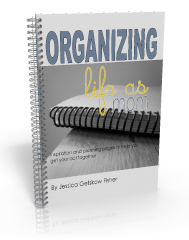 Find out more about the e-book and how you can get a copy at the Organizing Life as Mom homepage. I would appreciate receiving the emails you send out. Thanks!